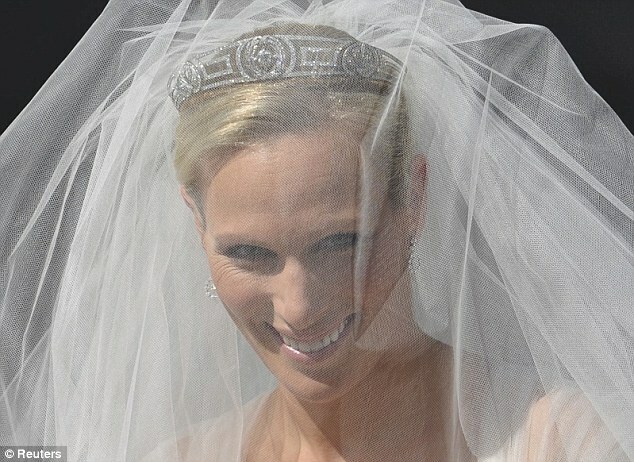 In the second Royal Wedding of 2011, Zara Phillips, the Queen's granddaughter, has married her long-time love, Mike Tindall. Mike Tindall is 32 years old. He's a 6'2" England rugby player (and captain). He's been in Zara's life since 2004 on a permanent basis and has always been a hard worker on the pitch, and a seemingly decent, loving and dedicated boyfriend. He's had his share of life's traumas. He suffered several serious injuries while playing including tearing a two-inch hole in his liver, a punctured lung, and a broken nose (several times). Zara is pictured here wearing her mother's Greek tiara and her beautiful wedding dress designed by Stewart Parvin. Shoes of course, were by Jimmy Choo . Her hair was done by Evangelos Tsiapkinis, and make-up applied by a group of artists at Bobbi Brown. All these certainly boosted the bride's confidence. Many well-wishers stood in the street in Canongate Kirk in Edinburgh, Scotland to see the second Royal wedding of year. They were fortunate to have a splendid day with lots of sunshine, and weren't disappointed in the celebrity department either. Of course, Zara's cousin, Prince William and his new wife Catherine were invited to the wedding. The family, based on the pictures here (let me warn you, there are hundreds of them) seem very happy indeed. The pressure to impress the world wasn't so great with this union, so Zara and Mike (by comparison) were noticeably more relaxed in their pictures than the above couple were. I hasten to say that the Duke and Duchess were both beautiful at their recent wedding. Royal Wedding would like to wish both couples long, healthy and happy lives together! They've got everything else. Here are some more pictures. Enjoy!